What is causing the VSB’s budget shortfall, if not surplus capacity? The Hon. Mr. Bernier, Minister of Education, hit the nail on the head when he said, “The result [of school closure] is that limited resources go where they should be, which is into services for students not into empty seats and empty classrooms.” The key to this tangle of obfuscation and political spin is “limited resources.” There is simply not enough money allocated to school Districts to provide equitable, accessible, and quality education to meet the diverse needs of all students. 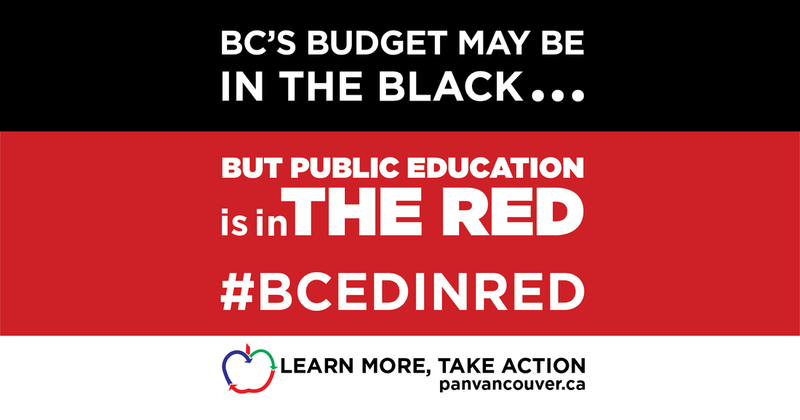 The provincial government has created a red herring out of “empty seats” to deflect attention away from the real crisis, which is the completely inadequate and unsustainable levels of public education funding it provides. In 2002, the Liberal government announced a new funding formula for education which moved from a formula in which enrollment was one factor amongst other determinants such as special needs, aboriginal, English language learner, climate, geography and transportation needs to a formula primarily driven by enrollment. (As a result, in Vancouver between 2001 and 2012, schools have lost 15 District librarians, 3 counsellors 121 special education teachers, 178 English language learning teachers, and 0.5 Aboriginal workers.) Whereas in the old formula money was allocated for space and infrastructure ($100,000 per elementary school) as well as funds for utility costs, in the new formula, space, because not funded, becomes a liability for school boards. In recognition of this, the government also that same year passed Ministerial Order 320, or the School Opening and Closure Order, which deflects all the responsibility of school closure from the Minister of Education (whose permission was previously required) onto the school boards who were now obliged to draw up policies and procedures for authorizing school closure as a bylaw. School boards, and not the Ministry, would be subject to legal action should parents protest. The Minister of Education now only needs to be informed of the name, place, and date of closure of a school. Premier Christy Clark also insists that "the solution to keeping schools open is to grow the economy." In a province that continues to outperform all others in GDP growth, per student spending remains the second lowest in Canada, abysmally below what BC can actually afford to invest given its current budget surplus. The limit, then, is one imposed entirely by the provincial government in its choice to de-prioritize public education. So while top income earners enjoy a $235 million tax break, school boards across BC are being forced to cut services to children by increasing class sizes; reducing library access; cutting specialist teachers, support workers, and arts programming; and closing schools. All to “balance a budget” with demonstrably insufficient funds. Instead of reinvesting in public education, the government seems intent on curbing the allotted physical space per child to meet ever-greater heights of fiscal austerity in the public education system.